Robert Briscoe shares his thoughts about making games as an independent developer. We talked about Robert’s career and development process of Dear Esther. Mateusz: Hi, tell us something about yourself, please. Where does your passion come from? Robert: My Name is Robert Briscoe and I’m a 32 year old environment artist recently turned Indie developer. I’ve been a 3D artist for over eleven years now, but only began dabbling in game art back in 2004 when Valve released their SDK for Half-Life 2. I’d previously studied multimedia design at Uni with the intention of becoming a 3D animator, but when I left there was a drought of jobs in that sector, combined with the fact that, well, as an animator, I sucked! So I took a slightly different route in order to get a job and ended up working for a defense contractor for a number of years, making simplistic 3D models of tanks, planes and ships. Back in those days I wasn’t really challenged and back then, military-grade real-time 3D engines were decades behind those of the games industry (at least the engine we used was) and it wasn’t long before I became bored of it. M: What attracted you to making games? R: I’d always wanted to make games since a very early age. When I was around 7 years old, we moved from the midlands down to the Southwest where I discovered for the first time, these fantastic places called “amusement arcades”. Looking back now they weren’t exactly fantastic for a 7yr old; a lot of them were rather dark, smokey and seedy places, but the glow and noise of those awesome arcade cabinets was something irresistible to me at that age. I used to spend every penny of my pocket money, much to the distain of my parents, playing games like Double Dragon, Bubble Bobble, Pac-Land and Wardner. Not long after, my brother and I received a second-hand C64 for xmas which further drew me into my passion for videogames. It was at this time I began to wonder how these amazing, seemingly magical things were made, and bundled in the box with my C64 came a big fat book about coding in basic. I spent hours copying out code onto the c64 to see simple games come to life and then tweaking the code to see what it would do. I never could properly get my head around coding though, and I eventually left behind my ambitions to make games for the next few years. It wasn’t until I got my first PC in 1993, a 386sx 40mhz with 2mb of RAM (if I recall correctly) that I began to dabble in creating games again. I spent most of my 14th birthday money on a piece of software called “Klick and Play” which was one of the very first, simple, game construction kits. With that I had loads of fun creating some awesome little shoot ‘em ups and platformers; but again, when it came to doing anything more advanced and there was coding involved, I would get stuck and lose interest. I think it was another 6-7 years before my curiosity in game development returned, this time with the release of Half-Life 2 and its SDK. As I mentioned earlier, at this point I was growing increasingly bored in my job, frustrated with the limitations of the tech we were using, and had been enviously watching the development of Half Life 2, fascinated by how far their tech had come and how beautiful and immersive the environments were in the game. I decided to download the SDK tools for HL2 and see for myself just how these worlds were being constructed. For around a year I spent almost all of my time outside of work learning, creating and experimenting with Hammer and the Source Engine. I found it to be such a fun and creative experience in comparison to the restricted regiment of my day-job and I think it was at this point that I realized my passion lay in games development. M: Why did you choose game industry and how did you break into it? R: As I said earlier, I found the whole process level design, and more specifically, the art side of things, fascinating – I loved being able to create levels or environments that I could run around in and be immersed in. For me it was the most satisfying thing I had ever done and the thought of getting paid to do it seemed perfect. I started off making a couple of DM maps that weren’t particularly popular (DM_Depot being the most memorable), but were good enough for me to be eventually recruited into a mod called Nuclear Dawn. At the time Nuclear Dawn consisted of some of the most talented people on the Source Modding scene, and it was working with such a talented group of people that really pushed me to improve the quality of my work – I learned a hell of a lot during my time on ND. It was also during this time that I found myself working more hours on my mod stuff than I was with my real Job, and enjoying it a hell of a lot more too! I think it was at that point that I realised that I needed to change things in my life and get my career facing in the right direction. So, as soon as my work was finished on the Nuclear Dawn, I began looking for a job in the industry. 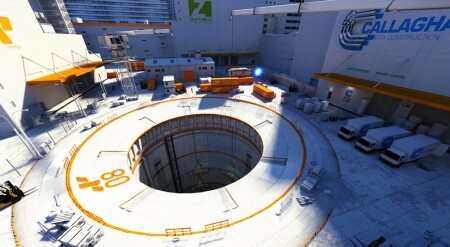 Fortunately, by then, quite a few members of the ND team had already been recruited by various game studios, and since I finally had some decent, relevant work in my portfolio, I used some of my new found connections within the industry to help land myself a job at DICE as an Environment Artist on Mirror’s Edge. M: Where are you working and what are your responsibilities there? R: Right now I’m currently self-employed, I’ve spent the last 3 years that way working on Dear Esther and have really spent the last year trying to unwind and recover from such a grueling development cycle. At this point I’d say I’m between projects, meaning that I’m just doing a lot of R&D to figure out what I’m going to do next. M: Are the first steps in the game industry hard? R: It can be hard to break into the industry because some roles and job titles are constantly changing and becoming more generalized I feel. For example, I’ve seen jobs advertised for Level Designers that require them to also make fully-fledged art assets, and Level Artists that are required to do level design and scripting. I’ve always said that you should always pick an area of games development you enjoy the most and specialize in that area, become a master of it, but these days that just doesn’t seem to cut it; these days it seems to be more valued if you have at least some general understanding of how games development works and some of the technical processes behind it. Saying that though, with the tools and engines that are available today, it’s never been easier to be able to get out there and make a game and learn everything involved, regardless of your skills or specialty. Unreal, Unity and Source are great examples of this, and my latest advice to any budding students of games design/art/etc. who’s willing to listen, is: if you’re studying or working, and you want to get into the games industry, then MAKE A GAME! The worst thing you can have in your portfolio is a bunch of random props, code demos, design docs, etc. with demonstrable application in a game or game engine – Make something playable. For art, It might just be an environment you can run around in, or for design, a simplistic level which demonstrates the gameplay mechanic or design you dreamt up – It’s really all about showing that you can apply and execute your ideas and skills in a relevant, practical way. If you really don’t want to go it alone, join a mod team! You’ll meet other talented people and be able to learn from them and experience what it’s like to work in a team and organize yourself and your workflow. M: You had to move to a different country. How did you take it? R: I think Stockholm was the biggest move for me, before that I practically hadn’t left the country in about 8 years, even for a holiday. It was a big step for me, but the biggest draw was that a lot of my ex-modding friends also lived and worked in Stockholm too, and it was awesome to finally meet all of them in real life after working for so many years behind a computer screen. The Swedes are friendly people in general and I think the fact that most spoke fluent English allowed me to adjust much more easily to life out there. Leaving that all behind and returning to the isolated confines of indie development was the one of the hardest things I had to do when returning to the UK to work on Dear Esther. I still miss being around other game developers and going off for Fredag öl at the end of the week. M: Where do ideas for your game environments come from? Do you cooperate with Concept Artists, Level Artists or Level Designers? R: For me it’s a mix between researching real life locations (finding photo references, going on trips, etc.) and working closely with the concept artist. With Dear Esther I gathered as much reference material on Hebridean Islands and the general terrain of the area as possible, and then employed the skills of our concept artist, Ben Andrews, to bridge the gap between the basic levels I’d designed and the world I wanted to create. Those concepts then gave me further ideas about the look, composition and palette of the final environment. 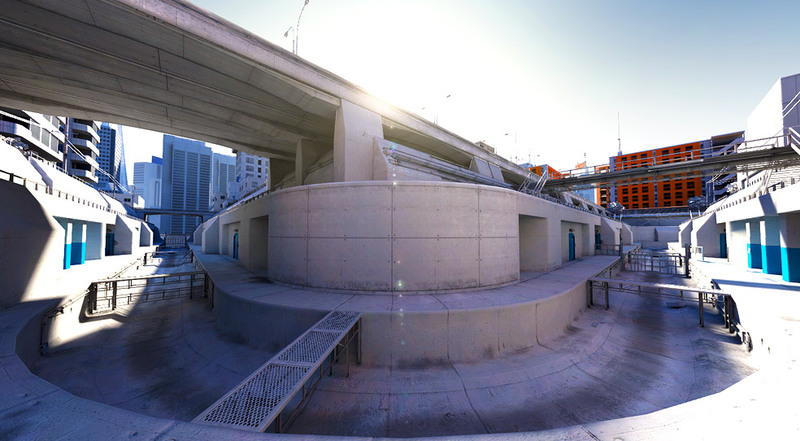 When I was working on Mirror’s Edge there was also a level designer in the mix, who played a separate role to that of the art, and it was my job to ensure that the design played well with the desired environment and art direction and vice-versa. M: The first time I saw the screenshots from Dear Esther, I was amazed and couldn’t believe it’s the Source Engine. What kind of problems have you encountered when making the game’s environment? R: I think my biggest problems were just trying to work around the technical limitations of the engine in order to create huge, open, immensely detailed environments in an engine that was never designed for that. Every aspect had to be carefully planned out and designed before any kind of art went into the game. The BSP based nature of the Source Engine doesn’t really lend itself well to large, organic outdoor environments, especially when it comes to culling and occluding, so a lot of tricks had to be used to ensure the visuals were not sacrificed at the cost of performance. The last level was an especially big challenge; it was one of the largest levels in the entire game and I also wanted it to outshine the others in terms of visuals and detail, with insane view distances both horizontally and vertically. The open nature of the level left me with no opportunities to occlude or cull stuff from view, so I had to use literally every trick in the book (and invent some new ones) in order to get it to work at a reasonable frame rate. I remember working for days at a time on it, optimising every model, every piece of terrain to then compile the map and find only a 3-4 fps increase. Lots of new swear words were inverted during those times! M: How did it go with licensing the Source Engine? Did Valve just answer: “Sure, go ahead”? R: Valve were understandably cautious of us when we first approached them about getting a Source Engine license, after all, they probably get a dozen emails every day from mod teams asking them the same thing. The first thing they told us was, come back when you have a community behind you and something playable that proves its popularity. Fortunately for us we already had the original mod and the community and critical acclaim that had already built up around it and we used that to help get our foot in the door and start talking. It was a long process of negotiations, talks, meetings and more negotiations thought before we finally came to an agreement that worked for everyone. As I have said before, Valve’s focus isn’t on licensing, it’s on making games, and as a result it took us almost a year before we finally put pen to paper and started the ball rolling on the commercial release. M: Will your next game be built with the Source Engine as well? R: It depends if Valve ever decide to adopt a more open way of licensing and updating their technology. 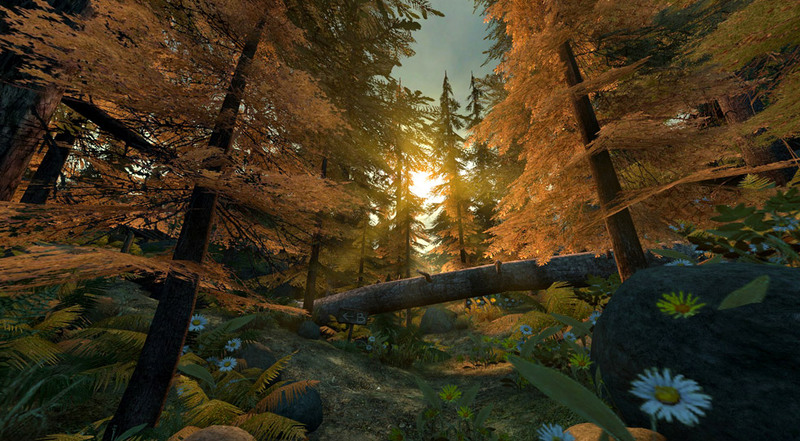 Right now Epic’s UDK and Crytek’s CryEngine are much more appealing, since you can simply get stuck into development without first having to worry about legalities, contracts and so forth, and when you know you have something that has value, then it’s just a case of filling out a form, paying a small fee and you’re ready to go. Unity is also looking more appealing every day with its growing toolset, multiplatform support and accessibility for non-coders like myself. M: I found Dear Esther very entertaining, and I’m looking forward to more of such storytelling-focused games. What do you think about the opinions that Dear Esther is not really a game? R: To be honest the question of whether Dear Esther is a game or not doesn’t concern me, to us it’s always been a game and we certainly didn’t set out to make anything else. I think we should really be celebrating how rich and diverse games have become these days, rather than debating what it is that constitutes the definition of a game. M: Dear Esther received lots of rewards in games industry and earned nice sum of money. As I remember from your comments you’ve never thought that DE will gain so much attention? R: I really had no idea! I was quite a bit in debt before Dear Esther’s launch, after a prolonged development had eaten up any savings I’d had, and I remember feeling quite sick leading up to launch, counting just how many units we would have to shift in order to keep a roof over my head and pay off my debts. At that point I’d poured about £32K of my own savings into making the game, but the thought of actually breaking even seemed unrealistic, at least in the short-term. It was more of a case of thinking “I hope we can make enough so I can keep myself afloat long enough to get a job”. We thought it would be a niche title that would sell maybe 50-80k over 6 months to a year if we were lucky, and I still remember thinking how 10,000 copies just seemed like an impossible number at that point. The first night of sales blew my mind, and has continued to over the past year. We’re currently sitting just shy of 350k copies sold, amazing for something that started out as an experiment. M: What about making a zombie shooter called Dead Esther? R: Maybe if the zombies are depressed and you have to shoot them with Prozac and positive words. 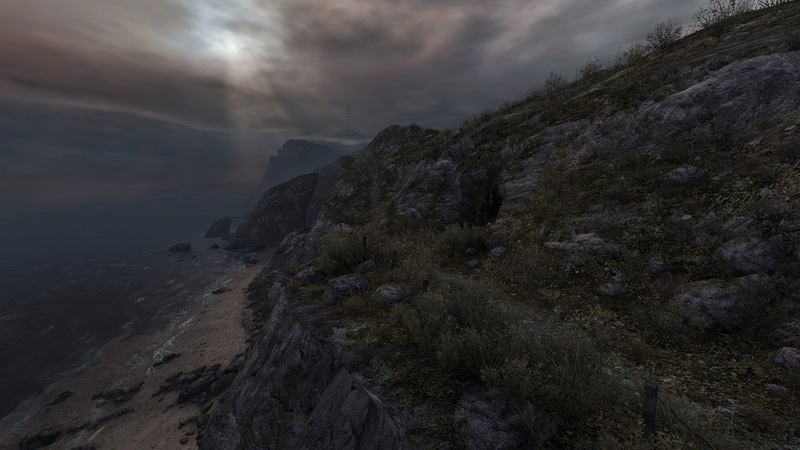 M: Dear Esther was a remake of original Half-Life 2 mod from 2008. How much freedom you had when remaking the first version? 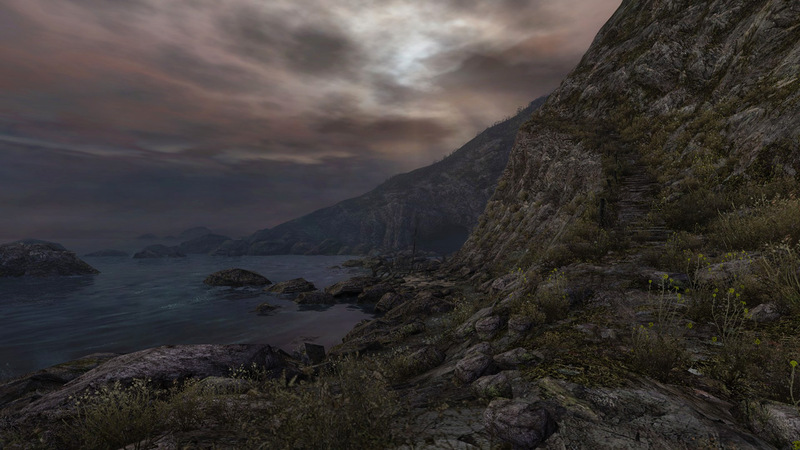 Have you been involved in development of original Dear Esther? Did you planned and re-designed the environment from scratch or maybe you’ve just stared adding details? 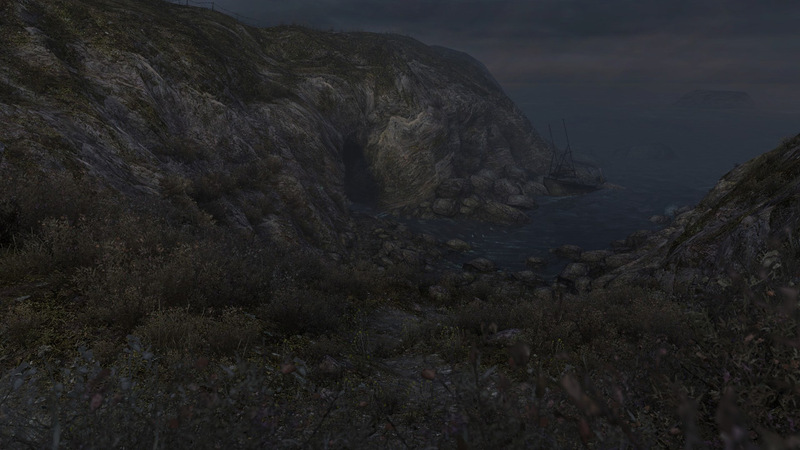 R: The original Dear Esther was conceived by Dan Pinchbeck as an academic experiment and built in-part by some of his students at the University of Portsmouth in the UK. I was still at Dice at this time, so it wasn’t until later that I came into the fold. I stumbled across it whilst just looking for something creative to work on during my year out. I thought the idea was brilliant, original and inspiring, quality of the writing and music that were already beyond that of most AAA games, but the design and visuals were rough around the edges back then and I felt that with a bit of polish and care it had potential to be something spectacular. I’ve pretty much had my hands into everything from the art and level design, right down to scripting and sound effects in the game – rebuilding everything from scratch. I think the only areas I haven’t really touched are the code and the Music which was re-mastered by the extremely talented Jessica Curry. Dan really gave me a free reign when it came to the remake, but we were always in contact throughout its development, either me picking his brains or him picking mine. I wanted to make sure that I wasn’t straying too far from his original vision whilst still bringing some of my own ideas, designs and interpretations to the table. R: As an indie developer, the best part is the creative freedom and ownership you have over your work and the successes which come from that; The ability to truly look at something and say “I made that!”. The worst I’d say is the isolation (at least for me, working remotely), the financial burden and the extra weight of the responsibilities you have to carry can also be tiresome at times. M: You think that it’s hard to go indie? R: Well, If you’re planning on quitting your job and going indie then plan ahead! Make sure you have a solid idea first and ideally have built some kind of prototype that works before jumping off the deep end. Most importantly, make sure you have the financial means to support yourself throughout the project – basically, however long you think it’s going to take to develop your game – double it, and then add on a few extra months for good measure! Same goes for students who’re looking to go indie after they graduate rather than head straight into a studio, it’s a great way to break into the industry, even if you don’t plan on being indie forever, you’ll get some real experience under your belt and possibly even make a bit of money at the same time! 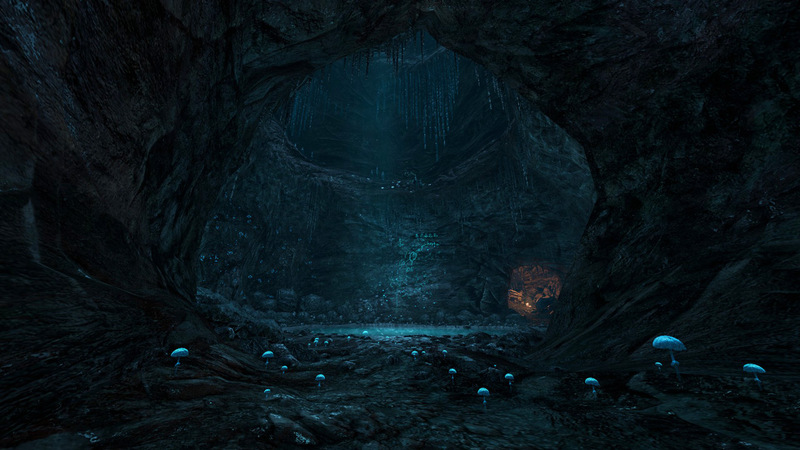 M: Dear Esther is highly immersive. What did job in DE to provide such a immersive world? Have you been planning that or it’s just a resultant of design decisions? R: I think immersion is born in the details, everything from subtle particle effects to the environmental sounds: waves breaking on the shore, subtle mist rising from the wet grass, water dripping from a crack in a stone wall, the bracing wind throttling your eardrums as your traverse the cliff tops; These details have been layered in and built up over the course of the game’s development and are vital to the overall experience. 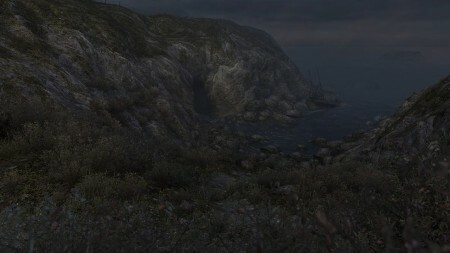 With the absence of traditional gameplay, I wanted the player to instead, be able to fully immerse themselves in the world, to stand on the beach and be able to almost feel the cold ocean breeze and smell the sea air, to explore and find interesting nooks and crannies with objects that further expand on the story of the protagonist and the history of the island. Every object, rock, blade of grass has been carefully crafted and placed to bring depth to the game in some way. M: What kind of references you’re using? R: I watch movies, lots of movies, and play lots of video games, search for obscure mods and indie titles, listen to music, read and basically try to immerse myself in as much creative material as possible in the hopes that it will trigger some creative spark within my own brain. M: What game titles you enjoyed last time or ever and what you can recommend? R: My all-time favorites are still the Stalker, Metro 2033, Half-Life 2 and more recently, and despite its flaws, Skyrim. I have a real soft spot for open world games which is probably quite obvious from that list. I really like being able to immerse myself in a world, do things at my own pace and have my own adventures. Aside from AAA titles I’m really enjoying some of the alternative stuff coming out of the indie scene at the moment, such as Proteus, Anna, Ether One and I’m also really excited about The Vanishing of Ethan Carter! M: Thanks Robert, it was a pleasure to interview you!